3 Bedroom Semi Detached House For Sale in Rotherham for Guide Price £230,000. IMMACULATELY PRESENTED and spacious three bedroom semi-detached family home. Located on this popular and sought after development. 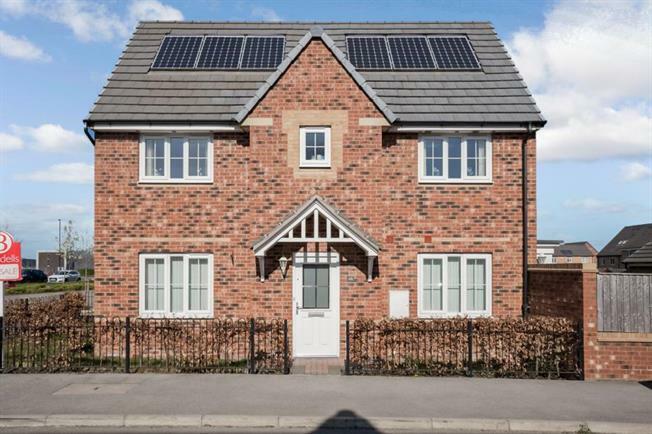 The property gives access to the Sheffield Parkway, the M1 motorway network and local amenities. The upgraded family home would suite a varied purchaser and in brief comprises of entrance hall with stairs rising to the first floor landing. W.C. has a white two piece suite. Lounge having dual aspect windows to both front and side. Dining room having tiled floor, rear facing French style doors to the rear garden and front facing window. Kitchen having a range of fitted wall and base units in white, tiled floor and store cupboard. First floor landing three bedrooms, master with fitted wardrobes and en suite shower room. Bedroom two with fitted wardrobes. Family bathroom with white three piece suite. Outside there is a garden to both sides mainly laid to lawn, drive and garage.